Looking for ideas on how I could use wheat berries, I came across a recipe for leeks with rye berries and adapted it to make my own version. 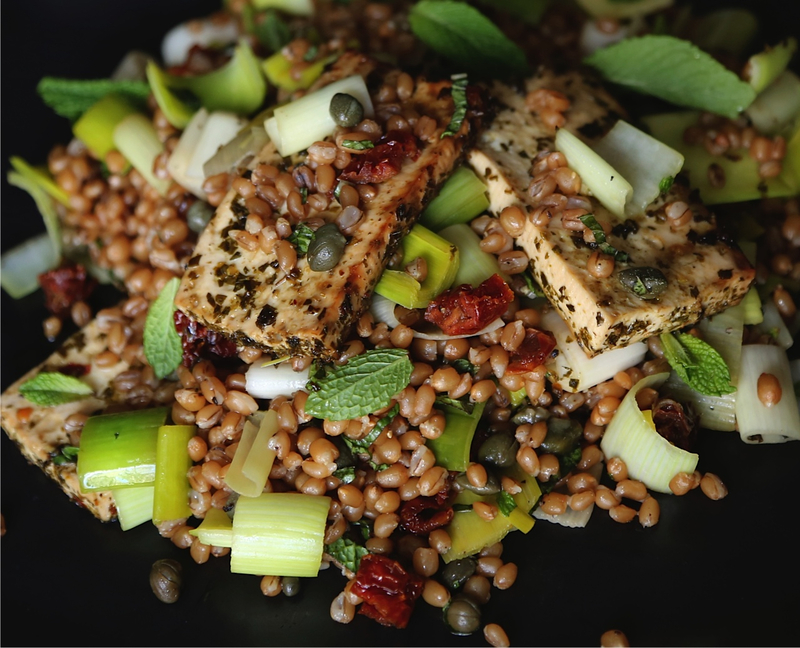 Here I combine leeks, wheat berries and another recipe I adapted for tofu with chimichurri sauce. To prepare the wheat berries, bring the water and the wheat berries to a boil in a medium saucepan. Decrease the heat to maintain a simmer, cover, and cook until the wheat berries are tender but still slightly chewy, 40 to 50 minutes. Drain in a sieve and allow to cool for 10 minutes. While the wheat berries cool, prepare the salad. Bring the leeks, vegetable broth and orange zest to a boil in a large saucepan. Decrease the heat to maintain a simmer, cover and cook until the leeks are soft, 5 to 7 minutes. Drain the leeks, and add them to a serving bowl with the wheat berries. Add the sun-dried tomatoes, ¼ cup mint, and the capers, fennel seeds, salt and pepper. Taste and adjust the seasoning. Place the tofu on top of the salad. Sprinkle with the remaining 2 tablespoons mint, and serve right away. Note: Wheat berries are best soaked about 12-18 hours. Use soft wheat berries if you can find them, but if you can only find hard wheat berries, I’d suggest soaking them about 24 hours. Combine water, oregano, and salt in a small bowl and let sit until oregano is softened, about 15 minutes. Pulse parsley, cilantro, garlic, and pepper flakes in a food processor until coarsely chopped, about 10 pulses. Add water mixture and vinegar and pulse to combine. Transfer mixture to bowl and slowly whisk in oil until emulsified. Cover with a plastic wrap and let sit at room temperature for 1 hour. 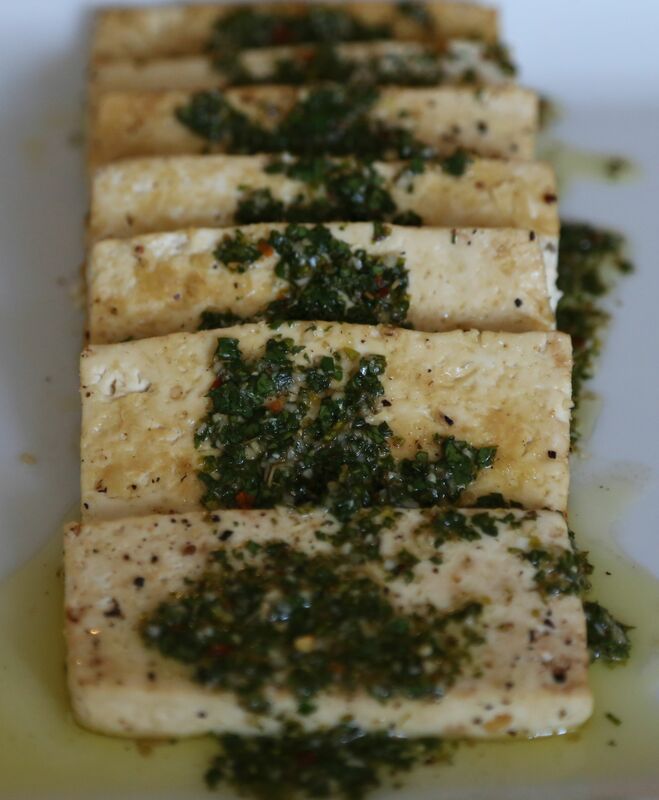 Combine olive oil and salt and rub entire surface of tofu with mixture. Roast, grill or lightly fry tofu until sides are browned a bit. Transfer to a serving platter and serve with sauce. Ancient Grains for Modern Meals’ Leek Salad with Grilled Haloumi Cheese and Rye Berries and Cook’s Illustrated’s Grilled Argentine Steaks with Chimichurri Sauce. Thank you Shanna and best wishes for a very Happy New Year to you too! Absolutely gorgeous and delicious salad.. I love a salad when grains are combined with hearty root vegetables,..that melange is awesome. Thank you, I too love grains in a salad! Their chewy and/or nutty addition helps to really add depth and texture. I should have mentioned in the post that I’m sure other grains like rye berries, farro, oat berries and perhaps even quinoa could also work with this salad. Thanks for your comment and support! Best wishes for a very Happy New Year!